United Airlines recently shot down one traveler’s request to bring her emotional support peacock on a flight departing Newark Liberty International Airport. Live and Let[’s] Fly reported earlier this week that even though the unidentified woman claimed that she had a second ticket for the peacock, the airline denied her request. Peacocks are exceedingly large and sometimes aggressive birds. Pretty though. The owners had been told three times in advance that they couldn’t bring their pet — I mean, comfort animal — on the plane. But they showed up with it at the airport anyway, no doubt expecting to crybully their way on board. For once outliers imperiously claiming to be defective do not get pandered to at the expense of the vast majority of normal people who find air travel unpleasant enough with animals urinating, defecating, biting, clawing, pecking, flying or slithering around the cabin, letting out ear-splitting cries, et cetera. Kudos to United for standing firm. On tips from Byron and Bodhisattva. Are sexual harassment pandas allowed? That service animal crap is nothing but bullsh!t. I know a guy who got his Yorkie registered so he can bring the damn thing into or local bar. Now the damn dog takes up stool. I am so glad I’m retired from the restaurant/bar business because between Yelp and these idiot leftist laws I’d be in jail. Can you imagine being cooped up with a bird that sounded like this for a long flight? I’d almost prefer the colicky baby. So, I’m guessing my emotional support anaconda is out of the question? United’s nasty to everyone! 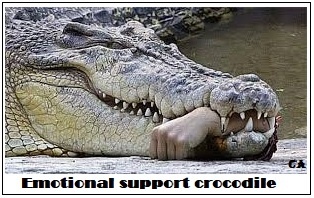 I’m sure a decent airline will welcome my emotional support crocodile. They taste good too. They are giant pheasants. The British ate them in India. A park near where I lived had them. It was over a mile away, and you could often hear them screeching. Not as clearly as the guy practicing his bag-pipes, but clear enough to identify. The ADA needs a serious do over due to loopholes like this. Fake service animals are a threat to real service animals because they are untrained pets. I get that not disabilities are visible, such as a medic alert dog for seizures, but there NEEDS to be a real registry and the handler should be able to provide legit papers for their animal. It’s annoying but it will cut down on people bringing Fluffy to the store. Is it good around children? you can buy all the faked service dog/animal gear including an ID card on eBay. That needs to be stopped immediately. 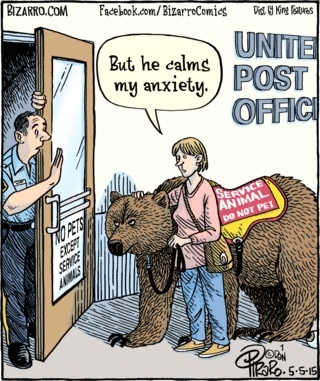 ‘Emotional support animal’ nonsense needs to be stopped immediately as well. There’s a difference between a person with PTSD and some wimpy little beyotch that wants to hold muffy the mutt on her lap on a flight. It’s gotten way out of hand, to the point where, as far as I am concerned, anyone who can’t survive in public without an “emotional support animal” needs to stay home – or grow up. They are constantly pushing to see how far they can get. Just wait, they will be sued for this. Gloria Allred, please pick up the white courtesy phone! Make way for my Existential Threat Penguin. He doesn’t take sh*t from anyone.